The amazing thing about service is that it rarely returns void, even if we don’t see the end results ourselves. Service has a way of inspiring others to see the areas of need around them and step out of their comfort zone to help someone else. My husband Eugene and I saw this happen in a beautiful way during one particular season of serving. Our friend David and his wife Janet were in our church from the very beginning. She was our organist. Theirs was a blended marriage; they each had three children. Tragically, Janet got cancer and passed away, leaving David with all those children to care for. David had a good job and was working in Baltimore, but before Janet died, the company got moved to the West Coast. His hands were tied. He couldn’t move his dying wife and kids at that time, so he ended up getting a job that financially didn’t allow him and the children to stay in their house. At first, the grandmother took the kids up to Pennsylvania, where she lived, but they were very unhappy there. They were used to living in their hometown, and they wanted to be with their father. So my dear, blessed husband said to David, “Well, we’ll take them in.” Two of the children had already left home, so we welcomed the younger four—three boys and one girl—into our home, in addition to our three children. Our daughter, Karen, was ten, and our boys were two and three years younger than her. It was a houseful! We only had three bedrooms. Thankfully, by that time, the church had been built, so we no longer had anyone in the basement. The whole basement was empty except for Eugene’s workshop and study. We put the boys down in the basement, and the girl shared a bedroom with Karen. Those children were with us for about three months. And it went okay. The septic tank overflowed, so we had to figure out what to do there. We carted the kids back and forth to the church to use the bathroom! That’s the thing about service: It’s not easy. A lot of times, you’re going to serve when you don’t feel up for it. I had to fix seven school lunches when we really couldn’t afford to buy lunch for everybody. There I was in the morning, preparing all these lunches and getting breakfast for the kids and sending them to the schoolbus—it was overwhelming! So Eugene organized the kids so they helped with packing their lunches. But you get tired in the midst of a heavy service season, when you wonder, How long? But here’s what bolstered us in the midst of that season: As we were living sacrificial service, the church began to do the same. 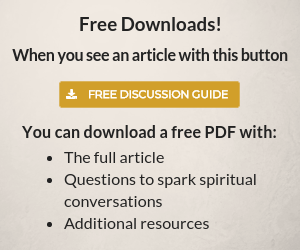 Prior to this, Eugene had tried to get people in the church aware of others who were going through a hard time. He’d make phone calls, asking for things like meals for new parents, trying to create a community of service. No one seemed to want that sort of community. But then we took in the children. The church couldn’t believe it. 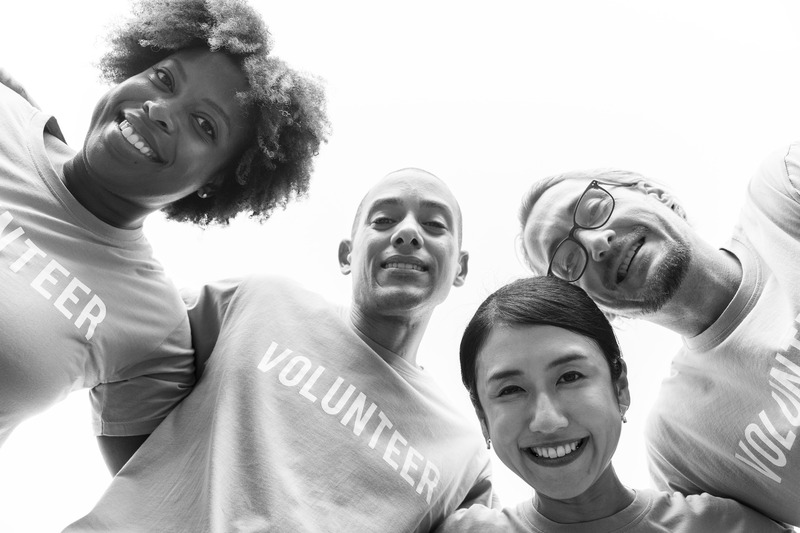 People seemed overtaken by the idea of service—and they started pitching in. People started bringing food to the front door. The deacons said, “We can’t let the Petersons just feed these kids out of their living,” so they started giving us extra money for food. Somebody gave us bunk beds and a cot for the boys. And, sweetly, a family in the church invited David to come and live with them until he could get a place for both him and the kids. When we had been longing for community, community suddenly appeared. That’s because service creates a community of giving. We never had to make another phone call. When I think about being a servant, serving in Jesus’ name, I am reminded of a favorite verse from Luke 1:37-38. The angel Gabriel was visiting Mary, telling her she would be the mother of Jesus, “Son of the Highest.” And he also told her about her cousin Elizabeth, who was old and barren but was now pregnant with a son. The angel said, “Nothing, you see, is impossible with God.” And Mary said, “Yes, I see it all now: I’m the Lord’s maid, ready to serve. Let it be with me just as you say.” And so this should be our attitude as well! 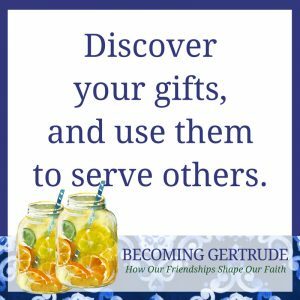 Whether we are serving the Lord or serving others in our families and friendships, our service should be unfettered, open, and willing. It’s such a strong response. We should be ready to spring into action, loving our friends in concrete and active ways. Just like Mary, we should have the courage to serve where God calls us, not in the ways the people around us expect. And we should be humble and willing to accept the help and service of others, just as Mary accepted the love and service of Elizabeth, who encouraged and lifted up Mary in the midst of a time when no one else understood her. May we all have the desire to serve God in Mary’s spirit! Fiat mihi—may it be unto me. Amen. 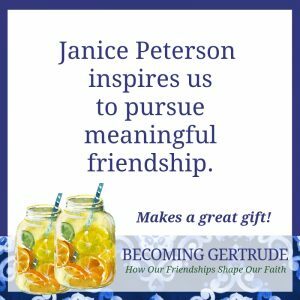 You have just read a portion of chapter 3 from the book, Becoming Gertrude: How Our Friendships Shape Our Faith by Janice Peterson.